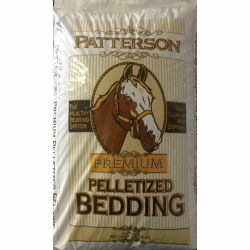 This bedding is highly absorbent (wet spot actually clumps) & Fine textured to sift easily. When softened by adding 1 to 1.5 gallons of water per bag, the pellets expand 3-4 times their compressed volume. 100% Southern Pine wood fiber is heated to remove potential allergens. Reduces disposal volume by up to 50%. Five to six bags will start a 12 x 12 stall and that is all that is needed.